A masterpiece in style and design' is how the John Lennon Imagine Signature Series harmonica could be described. This harmonica looks stunning! With its white enamelled cover plates overprinted with the word 'Imagine', John Lennon's signature and his cartoon 'self portrait'. The reed plates are polished brass on a crystal clear comb. The harmonica which is tuned in the key of C, has a strong and fully responsive tone, and is presented in a white plastic case with a transparent, sprung, hinged lid. The white, book-like, presentation case has a copy of John's signature with his cartoon printed on the front; on the side, is a brief story about him, and on the reverse is a photo taken early in his career. The case is secured by magnetic catches, opening to reveal another photo of John playing the harmonica. 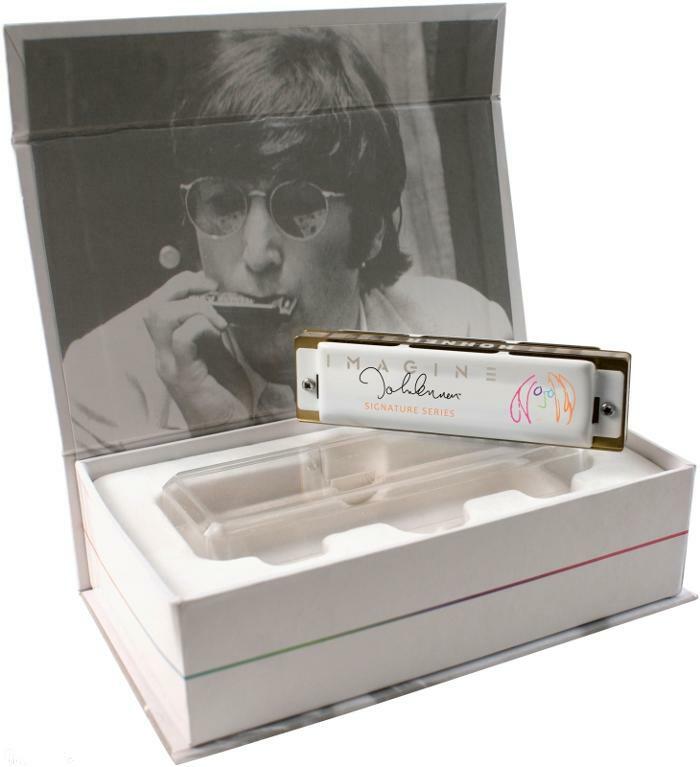 This harmonica would make a great gift and is a must for any John Lennon fan. Following in the footsteps of the popular Bob Dylan and Steven Tyler Signature Series, Hohner Inc. released the John Lennon IMAGINE Signature Series harmonica. Featuring brilliant white cover-plates, stylish white packaging, and a clear acrylic comb, the ‘IMAGINE’ harmonica pays tribute to the legacy of John Lennon, one of the greatest musicians and composers of the 20th century. John Lennon began playing the harmonica when he was a child in Liverpool and was greatly influenced in the 1960’s by American blues music. His playing on number one hit songs by the “Fab Four” like “Love Me Do’, “From Me to You”, “Please Please Me”, and “I Should Have Known Better” inspired a whole new generation of harmonica players.